Denmark is the smallest of the four Scandinavian countries and has a population of 5.3 million, yet despite its small stature, offers visitors much to experience. After traveling through the Danish island of Funen in May 2006, Edward F. Nesta and I took a train from Århus to spend a few days in Copenhagen, also known as København, the capital of Denmark, which has a population of 1.7 million exploring the city. We found that getting around Denmark using the Danish State Railways DSB rail service to be convenient, comfortable and reliable. Scandinavia is known for its design, and we stayed at the 260-room Radisson SAS Royal Hotel, which was designed by Danish architect Arne Jacobsen in 1960, who also designed many of the important buildings throughout Denmark. 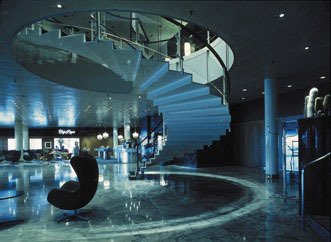 The hotel has two restaurants, Café Royal and Alberto K located on the 20th floor. Read our articles on the hotel in the Hotels and Resorts section, and on Alberto K in the Restaurants section. Copenhagen offers visitors an outstanding selection of restaurants ranging from typical Danish open-faced sandwiches called Smørrebrød to gastronomic restaurants, which include ten restaurants, which have received Michelin stars. We enjoyed dinners at the following commendable restaurants, each with its own distinctive style. Alberto K is located on the 20th floor of the Radisson SAS Royal Hotel affording guests with a breathtaking panoramic view of Copenhagen. This stylish restaurant opened in 2001, and features Arne Jacobsen's famous chairs "The Sevens" and contemporary design. Executive Chef/Restaurant Manager Betina Repstock joined the restaurant in 2003, and her culinary creations command equal attention with the views. A few of the tempting selections that we had were Langoustine, Buckwheat, Cucumber Melisse, and Frozen Yogurt; Quail, Basil Gnocchi, Radish, Quail Egg and Ice Salad, and Zander, Squid, Spinach, Marjoram and Meringue. Please read our Restaurants section for the article on Alberto K.
Kong Hans K Kælder holds the distinction of being in the oldest room in Copenhagen. The name Kong Hans Kælder translates to King Hans' Cellar, and the cellar dates back to the 12th century. 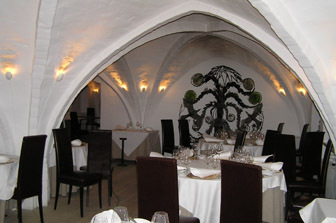 The restaurant also holds the distinction of being one of the 10 Copenhagen restaurants with a Michelin star rating. The restaurant opened in 1976, and Executive Chef/Director Thomas Rode Andersen joined the restaurant in 1997. The sculptural architecture of the restaurant provides the perfect showcase for Chef Thomas' stellar creations. There are two menus to select from, Innovation and Signature, which change monthly according to the seasons. Two of the excellent Signature dishes that we experienced included Oysters from Marenne Oléron with Cowberries, Smoked Oil and caramelized lemon, and Monkfish with Pata Negra Fat, Jerusalem artichokes, Pickled Mushrooms and Apples. Please read our Restaurants section for the article on Kong Hans Kælder, and Chefs' Recipes section for an interview with Thomas Rode Andersen where he shares tempting recipes. 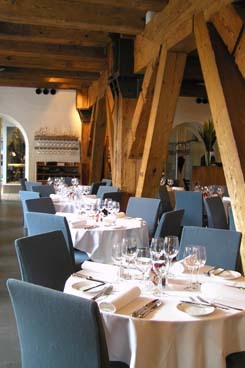 SALT Bar-Restaurant is located in a former granary dating back to 1787, and is a listed building in Copenhagen. 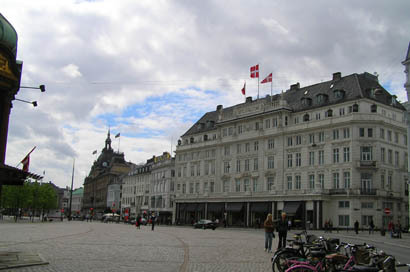 It is located on the water, a short stroll from Amalienborg Palace and the Queen's Garden. SALT Bar-Restaurant opened in 2003, and Rasmus Møller Nielsen is the Executive Chef. Appropriate to its name, the restaurant offers guests a selection of three types of salt: Laesø boiling salt from the Danish island of Laesø, Guerande Sel from France, and Maldon Seasalt from Essex, England. Two of Chef's Rasmus' delicious creations that we tried were Fried Garfish and Norway Lobster with Polenta Crème and Rocambole and Lemon Pavlova with Raspberries, Macadamia Nuts and Manjari Chocolate. Please read our Restaurants section for the article on SALT Bar-Restaurant and Chefs' Recipes (in English and Danish) section for delicious recipes from Chef Rasmus Møller Nielsen. Copenhagen has a rich history and offers visitors much to see and do from palaces, museums, shopping, music, amusement parks and much more. We purchased a CPH Card, which provides holders the opportunity to visit around 60 museums and attractions. The cards can be purchased online or at the Copenhagen Airport, at larger rail stations and tourist information offices, and can be used to travel free on public transportation (buses, harbor buses, train and Metro). We found the cards to be very convenient, and provided us with either free access or reduced admission to many museums and attractions. 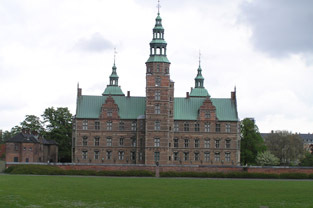 Denmark has the oldest kingdom in the world, and a trip to Copenhagen would not be complete without a visit to Rosenborg Slot (Rosenborg Castle) built in 1606 by Christian IV (1577 - 1648) as a country summerhouse, with a renovation in 1624 in the Dutch Renaissance style. This is a fairytale castle, where we had the opportunity to see the Crown Jewels, including the crown of Christian IV, which is remarkable in its design. 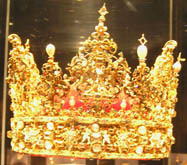 The inside of the crown is lined with miniature coats of arms, and the exterior is a work of art with miniature angels, delicate filigree, and is adorned with jewels. Of special interest is the twelve Rosenborg Tapestries, which date to the 1600s and depict the Scanian War (1675-79). During our visit there was also a special exhibition on Christian IV as well as royal christening gowns. We took a tour of the Rosenborg Castle Gardens where the lilac trees and tulips were in bloom, and were just in time to see the Royal Danish Guards departing for the changing of the guards at Amalienborg Palace, the Royal Family's residence in Copenhagen. 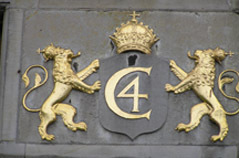 The Royal Guards depart from the barracks at Rosenborg Slot each day at 11:31 am. The castle is closed on Mondays from January - April. Hours vary according to season, but as a general rule, it is open at a minimum from 11:00 am - 2:00 pm. Check their website for the complete hours. Admission is charged, but there is a reduced charge for CPH Card holders. Denmark is famous for its' Baltic Sea amber, and we found our visit to the Copenhagen Amber Museum to be very informative. There are more than 300 different kinds of amber in the world found on every continent. The geological ages of the amber vary significantly from 2 - 200 million years and the amber made from a wide variety of trees. 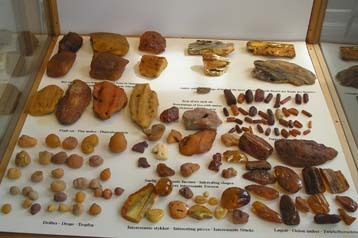 The amber found in Europe includes Baltic, Bitterfield, Austrian, Romanian, Czech, Ukrainian and Simetite. Important non-European amber includes Lebanese, Dominican, Syrian, Japanese, Chinese and Sarawak. Amber is called the "gold of the sea," and is also mined. The largest deposits are found in Samland/Sambia. Denmark is not allowed to mine for amber, and must gather the amber when it is washed ashore. The museum has the largest piece of Baltic amber that was found in 1969, by a Danish fisherman when the 10,478-gram piece of amber became entangled in his nets. A piece of the amber broke off, and it now weighs 8,886-grams. The museum is open every day from 10:00 am - 6:00 pm with extended hours until 8:00 pm from May 1 - September 30th. Admission is charged, but is free with the CPH Card. The Amber Museum Copenhagen also has a shop where amber jewelry and gifts may be purchased. Denmark is internationally known for its Royal Copenhagen porcelain, which was founded in 1775. Their museum is a must not only for porcelain collectors, but also for those interested in history. The museum has an exceptional collection of antique porcelain. The first piece produced was their Blue Fluted (Mussel) design, which is Denmark's oldest porcelain, and was inspired by a Chinese chrysanthemum. Today, it is considered to be Denmark's national dinner service. The porcelain is still made by hand, and is hand-painted, with each plate requiring 1,000 brush strokes. Flora Danica was created in 1790 when the King decreed that Royal Copenhagen would receive the botanical illustrations to produce exactly as the botanical originals. Visitors can watch demonstrations of porcelain painting as well as try their hand at painting. 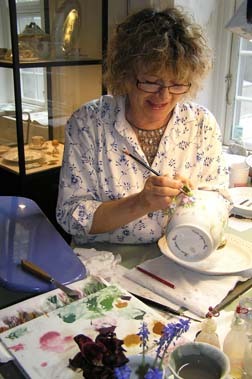 Mrs. Herdis Myrseth of Royal Copenhagen demonstrated painting Flora Danica, and although she has worked at Royal Copenhagen for 37 years, she has still not painted all of the flowers in the Flora Danica collection. The museum is open Monday - Friday from 9:00 am - 4:00 pm. Admission is charged, but is free for CPH Card holders. There is also a factory outlet shop on the premises. We visited the Guinness World Records® Museum, which has an unusual collection of records. The museum is open every day from 10:00 am - 6:00 pm, with extended hours at various times of the year. Check their website for complete hours. Admission is charged, but there is a reduction for CPH Card holders. 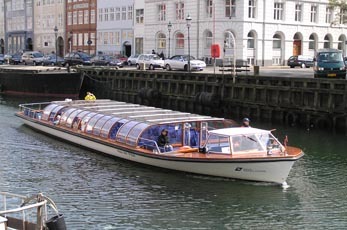 A wonderful way to see Copenhagen is by taking a canal tour. We took a narrated 1-hour DFDS Canal Tour that departed from Nyhavn Canal, where some of the highlights included passing the new Opera House, the famous statue of The Little Mermaid by the sculptor Edward Eriksen, Amalienborg Palace, the "Marble Church", the Royal Library called the "Black Diamond", and had the opportunity to watch the runners in the Copenhagen Marathon. The canal tours operate from March until December beginning at 10:00 am. Hours vary throughout the year, so check their website for their complete hours. Admission is charged, but there is a reduction for CPH Card holders. 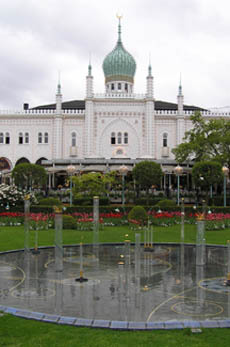 We visited Tivoli, founded in 1843 by Georg Carstensen, that is one of the world's oldest amusement parks. The wonderful 82,717 square meter park has 38 restaurants, gardens, 26 rides, shops and live music. Tivoli is open from April - December from 11:00 am - 9:00 pm. There are special events, as well as extended hours at certain times of the year, so check their website for their schedule. Admission is charged, but it is free for CPH Card holders. There is an additional charge for rides. Every year in May, Copenhagen holds a 3-day Ølfestival (Copenhagen Beer Festival), and we had the opportunity to visit Ølfestival 2006 and experience Danish and international products from over 80 distilleries. Read our article on Ølfestival 2006 in our Liquor Cabinet section. Copenhagen is very much alive with music with a wide selection of clubs with live music. Two of the jazz clubs that we visited were the Copenhagen Jazz House and La Fontaine. At the Copenhagen Jazz House, we heard the Saxopaths, an exciting sax quartet featuring Kristoffer J. Rosing-Schouw (soprano sax, alto sax), Bob Jackson (alto sax), Anders Banke (tenor sax) and Niels Oldin (baritone sax), performing with guest musicians Peter Bruun (drums) and Jonas Westergaard (bass), who won the Danish Radio Talent Prize in April 2006 during the Danish Music Award Jazz 2006. 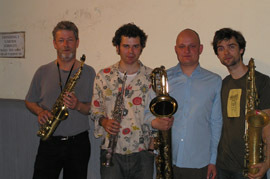 Read our article on the Saxopaths in the Music Scene section. La Fontaine is an intimate jazz club that tends to recall the old days of jazz with its smoke filled room. 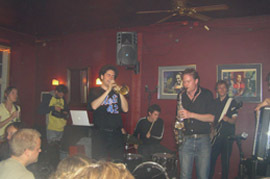 The night that we visited, the club was packed with an appreciative audience during the filming of a Belgian band. One of my best tips when visiting Copenhagen is that if you like to walk, make sure that you bring flat comfortable shoes, as many of the streets, including Strøget, Europe's longest pedestrian shopping street, have cobblestones. Denmark's currency is the Danish krone and there are 100 øre to the krone. ATMs are readily accessible, and credit cards are accepted almost everywhere. The voltage is 220 volts. After a wonderful time in Denmark, it was time to return home. We flew SAS Scandinavian Airlines direct from Copenhagen to Newark Airport, where service began in their Business Lounge that was so large they could almost land a plane in there. The attractive Scandinavian design lounge offers travelers a welcome oasis at the airport with a Business Center, 6 Internet terminals, separate work areas, 6 showers, a children's lounge with games and DVDs, comfortable seating areas, a fireplace, magazines and international newspapers, as well as food and beverages including Carlsberg and Tuborg beer from Denmark to leave a last taste of Denmark with travelers. There is also a separate lounge for Star Alliance Gold Card Members with Alliance tickets. There are 2 resting rooms that are like small hotel rooms with a twin bed, alarm clock, telephone, chair, bathroom with shower and hairdryer. There is a Business area with faxes, 4 Internet terminals, 3 massage chairs, a fireplace, comfortable seating areas, a separate large smoking room, and mobile phone booths for privacy. 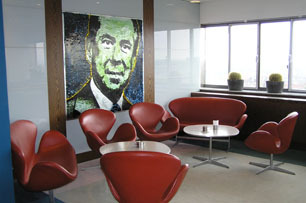 Food and beverages are available throughout the day, and meeting rooms can be reserved for a fee. Although most Danish speak English, I have included some basic vocabulary. It is important to note the pronunciation of the following letters: å = aa, d and g are silent in the middle of a word, and h before a v is also silent. The word Hej is pronounced like "hay", and Ny is pronounced like "new".